KORONADAL CITY, January 31 (PIA) -- Two unique products from Region 12 or Soccsksargen Region have been selected for international branding development in cooperation with the Japan International Cooperation Agency (JICA), a top official of the regional Department of Science and Technology (DOST) confirmed. Dr. Zenaida P. Hadji Raof Laidan, DOST-12 director, identified the two distinct products from Region 12 as the “Kafe Balos” and T’nalak cloth. These products, she said, were chosen to be among the eight Philippine products for international packaging and country branding development by DOST-Industrial Technology Development Institute (ITDI) and JICA. Laidan said they collaborated with ITDI, a DOST attached agency, and JICA to empower the micro, small and medium enterprises (MSMEs) to become globally competitive. “One of our major priorities this year is to enhance the competitiveness of unique Philippine products in the global market through attractive packaging design using appropriate packing technology,” she said. “Kafe Balos” is a coffee product from the Arabica variety that is fermented in the stomach of civet cats, or “Alamid” in Filipino. The venture involves the B’laan tribe in Mt. Matutum, South Cotabato’s landmark peak straddling the towns of Tupi and Polomolok, covering a coffee plantation area of nearly 500 hectares. On the other hand, T’nalak, a hand-woven colorful cloth fashioned from abaca fiber, is produced by the T’boli tribe in scenic Lake Sebu town. Laidan said the international design packaging development project is not just limited to unique products but also includes fresh and semi-processed agricultural products. In the region, she particularly identified them as papaya and marine-based products. The regional DOST chief urged MSMEs to avail of the agency’s packaging or labeling assistance, which come in the form of trainings and consultancy services. Laidan said they are also capable of analyzing microbial and nutrition contents, which are among the prerequisites to the overall packaging design of a product. These can be done through the Standard and Testing Laboratories (RSTL) and Halal laboratories located at the regional office within the ORC compound in Cotabato City. Another RSTL can be found at the Provincial Science and Technology Center in Barangay Calumpang, General Santos City. “These laboratories play vital roles in the standardization of products in our region, which can help the products become competitive,” she asserted. Last year, DOST-12 assisted the development of 102 label designs for food and non-food products, benefiting at least 47 beneficiaries, Laidan reported. 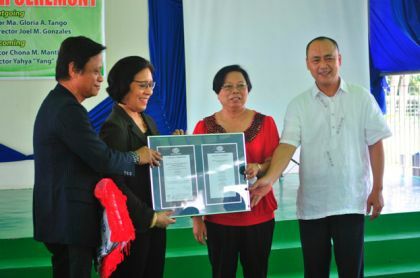 She noted that they collaborated with the stakeholders from the academe, business, non-government organizations and other government agencies in pursuing different development initiatives across the region. The DOST-12’s development thrusts have also been getting warm support from the stakeholders.